UPDATE: Sony's exclusive Harry Potter 3D bundle available from October 13 | What Hi-Fi? Sony has today confirmed that its Harry Potter and the Deathly Hallows 3D Blu-ray offer (see original story below) will be available on selected products sold in the UK from October 13th. 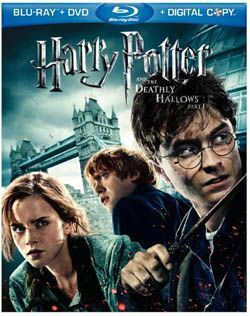 As well as the 3D Blu-rays of Deathly Hallows part 1 and 2, shoppers will also get a 2D Blu-ray of each film and digital movie vouchers to view the films in 2D on compatible devices through Video Unlimited on the Sony Entertainment Network or PlayStation Store. The promotion will run from October 13th to December 24th and can be claimed by picking up a form in store when buying a Sony product. Qualifying models for the promotion include the Sony BDP-S480, BDP-S580 and BDP-S780 Blu-ray players, as well as the BDV-EF200, BDV-L600, BDV-L800, BDV-E280, BDV-E380, BDV-E880 and BDV-E780 Blu-ray systems. US NEWS: The 3D version of Harry Potter and the Deathly Hallows: Part 1, which was never released in the cinema, will make its worldwide debut on 3D Blu-ray disc. But you'll have to buy specific Sony products – at least in the USA – to get the discs. From November 11th, when the standard 2D version of Harrry Potter and the Deathly Hallows: Part 2 is released on Blu-ray, Sony will also launch its special Harry Potter 3D bundle. Anyone who buys a Sony BDP-S780 Blu-ray player or Sony BDV-E380 home cinema system in America will qualify for the "Harry Potter 3D Experience", which includes both Part 1 and Part 2 of the Deathly Hallows on 3D Blu-ray, plus two pairs of Sony active-shutter 3D glasses, the TDG-BR250/DBL. It sounds similar to the exclusive tie-up Panasonic had with the 3D Blu-ray of Avatar, and we've put in a call to Sony's UK PR to find out when/if the bundle will be available in the UK. We'll keep you posted.